While this dish is really a mediterranean flavored dish it makes me think of the spring with all its green colors and fresh flavors. Even though it is still pretty cold here in the Northeast I am officially done with Winter. So why not lighten up the menu? 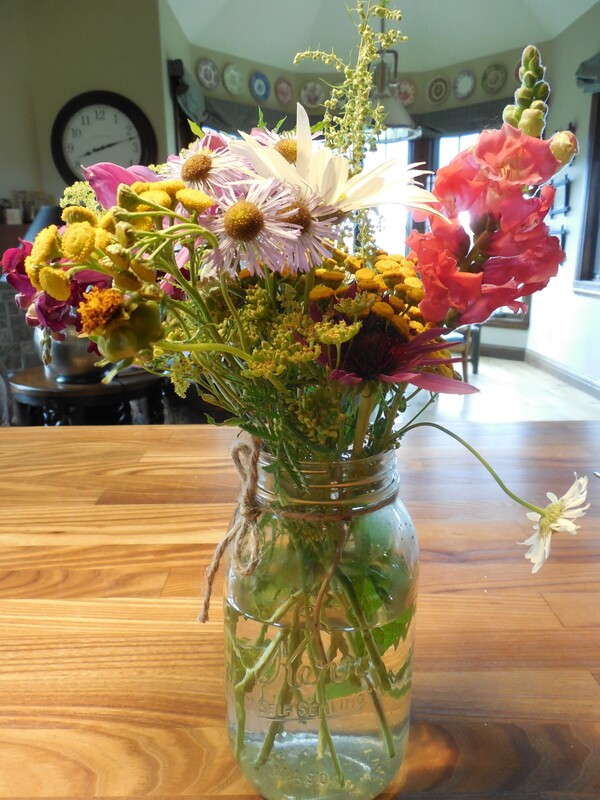 I am in a Spring mind-set now and this recipe screams Spring! 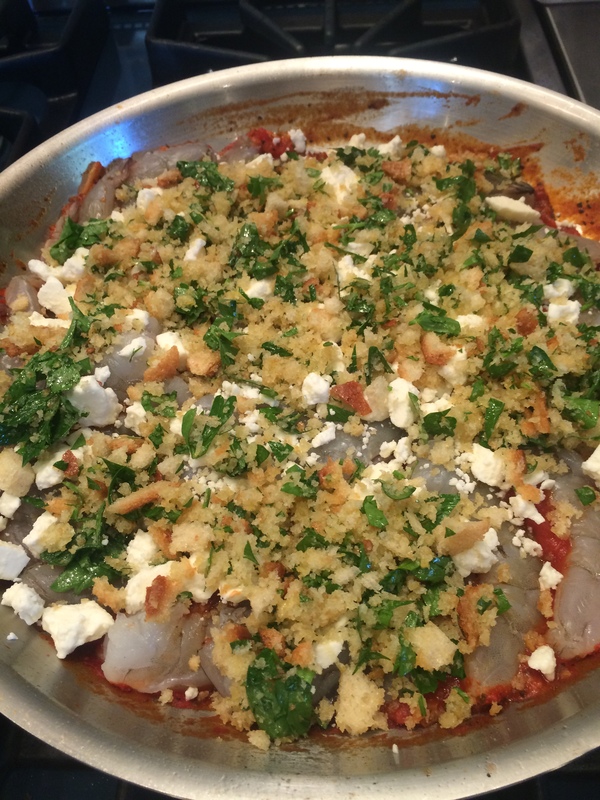 If you didn’t catch this recipe the first time around here it is again. All I can say is Wow!!!! I cooked about a lb.of beautiful shrimp and I wanted to use it in a delicious light salad incorporating some fresh corn and avocados. This salad has some of most favorite ingredients in it. 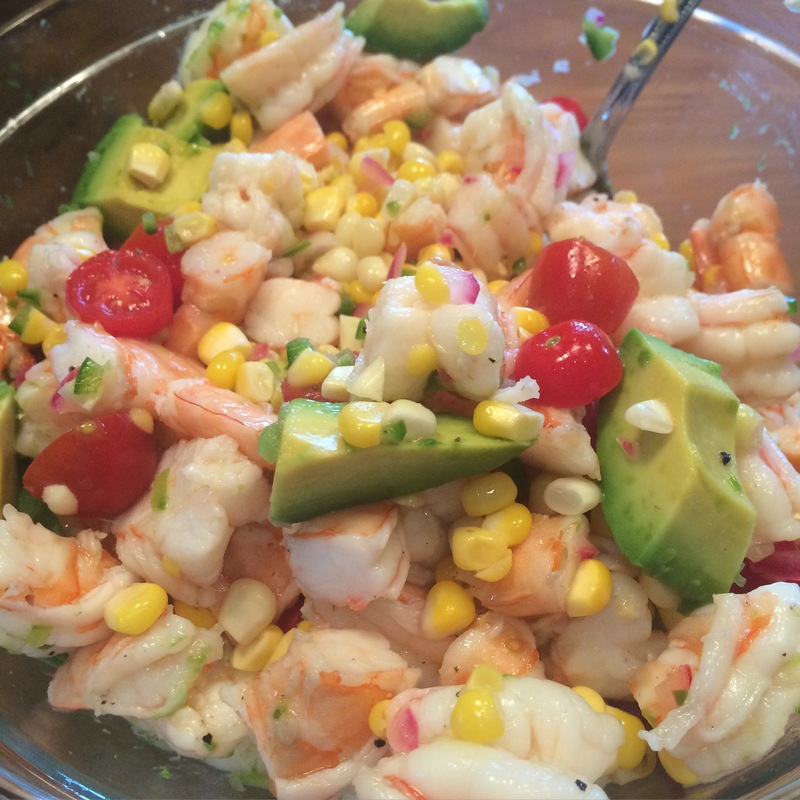 I used fresh corn, fresh tomatoes, jalapeno, red onion, and shrimp! Limes are the secret ingredient here because they add all the flavor to this super light dressing. This has got to be one of the healthiest most delicious salads. Totally not fattening but filling because of the shrimp , corn and avocados. If you don’t like the ingredients you can Pasadena on this recipe because it’s definitely not for you. For those of you into it this is a must go to for summer entertaining. Light and Fresh , low in calories and so so easy to make. If you like cilantro I would chop some up and add it, but a lot of people hate it so much I chose to not add. I removed all the seeds from the jalapeno and probably used 3/4 of a large one. One small seeded jalapeno is perfect and not hot at all. Be careful handling the peppers and the seeds, I’ve taken to wearing surgical gloves to cut up the peppers. This is a perfect summer salad, just don’t add avocados till you’re ready to serve, everything else can be assembled ahead of time. I put together in the morning of the day I was serving and then added my avocados right before I served. This is what I did. 1 lb. 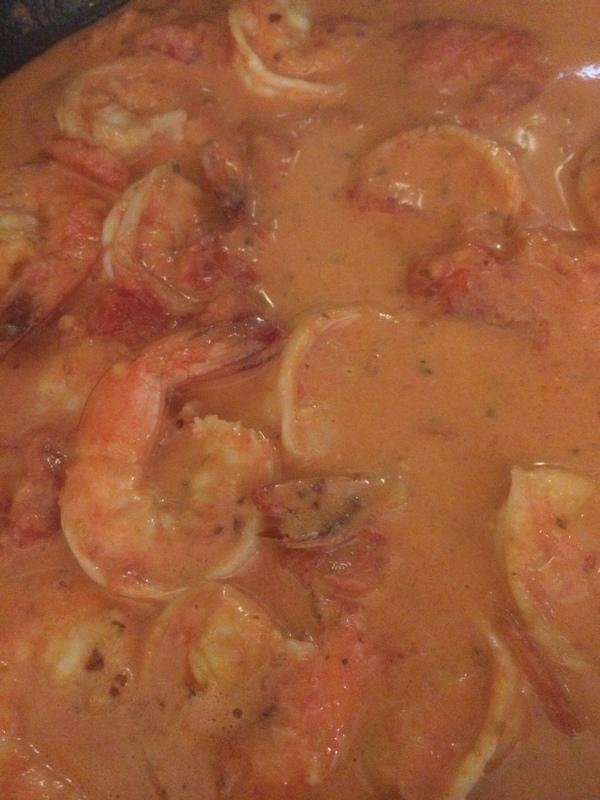 cooked shrimp (after cooking it should be 1 lb.) I then cut it up into smaller pieces. I probably cut each shrimp into 4 pieces. Remember I used under 10’s. So that’s 10 shrimp to a pound. You want the shrimp pieces to be bite size but not too small. 3 cobs of fresh cooked corn ( just put cobs in boiling salted water, bring to a second boil and remove and plunge into an ice bath) let corn cool and remove kernels from cobs. 2 limes-juiced , I use my juicer to juice because it’s tough with limes and you need as much lime juice as possible from 2 limes. I squeezed a third lime over at the end, but it’s probably not necessary. 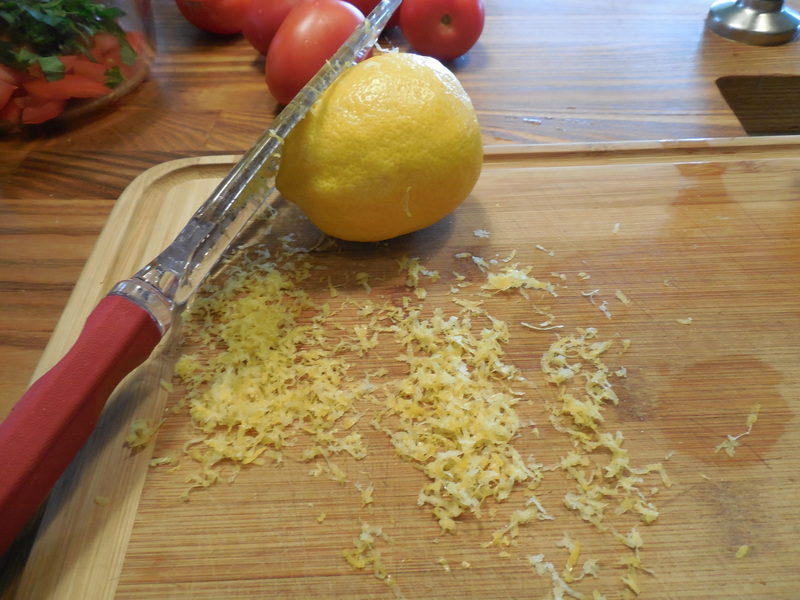 The citrus helps keep avocado from turning brown as well. I put in about 1/2 pint of small grape tomatoes, but you can eyeball if using larger tomatoes, I didn’t want tomatoes to over power the other outstanding flavors –if you prefer you can cut tomatoes in 1/2. I sometimes do this if I am not using the small grape tomatoes. 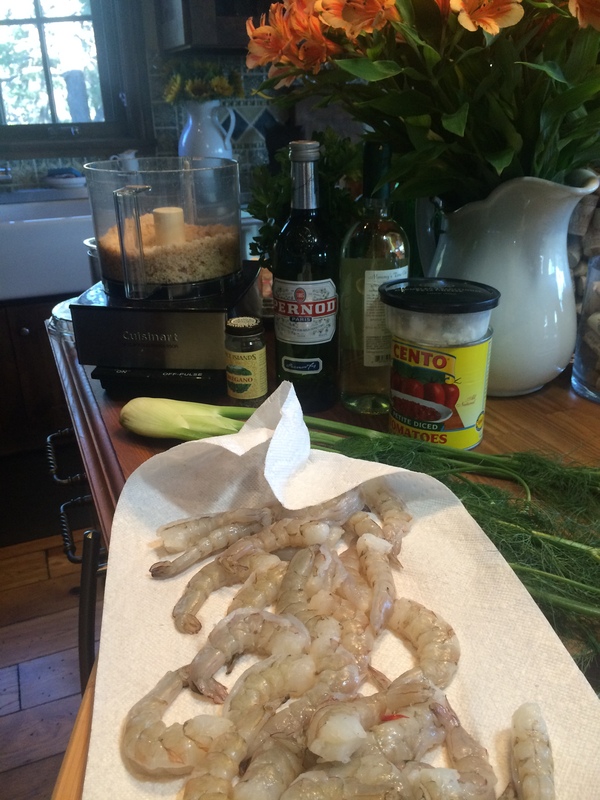 We Cook shrimp- peel and de-vein or buy it cleaned and de-veined whichever works best for you. I like cooking my own shrimp but you can certainly use a “cooked shrimp” readily available in most markets. I cut shrimp up into bite size pieces but not too small. Cook corn and allow to cool down. When corn is cooled completely down I cut kernels off. In a separate small bowl, place chopped red onion, lime juice, olive oil and salt and a little black pepper. Whisk together . I placed Shrimp, Corn, Jalapeno and Tomatoes into a large bowl. 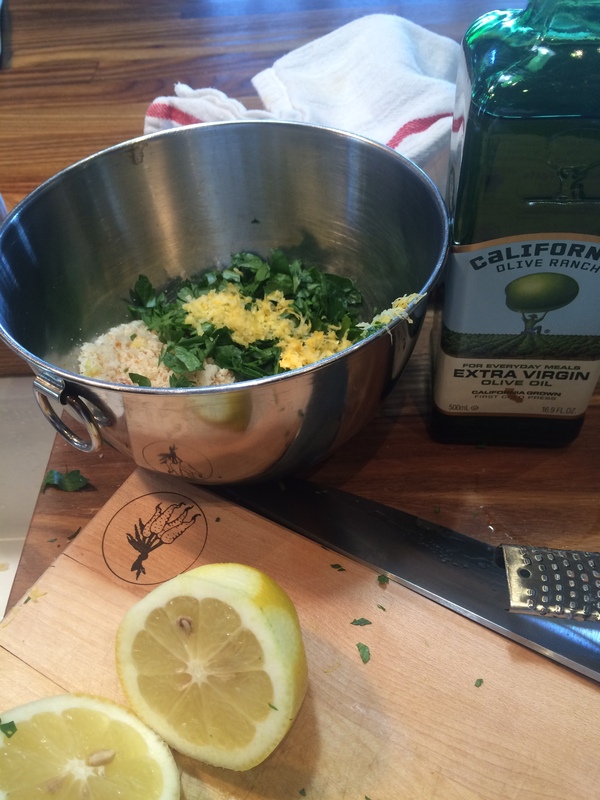 About an hour prior to serving I poured the lime juice combination over the bowl of Shrimp. Mix well and allow to sit and marinade. You’ll want to mix a few times before adding avocados to circulate the marinade. Taste for Salt and Pepper but it should be good. I added the 2 Avocados right before serving and squeezed a little more lime over it, probably not necessary but I did. If you’re adding the cilantro go ahead and add it now. 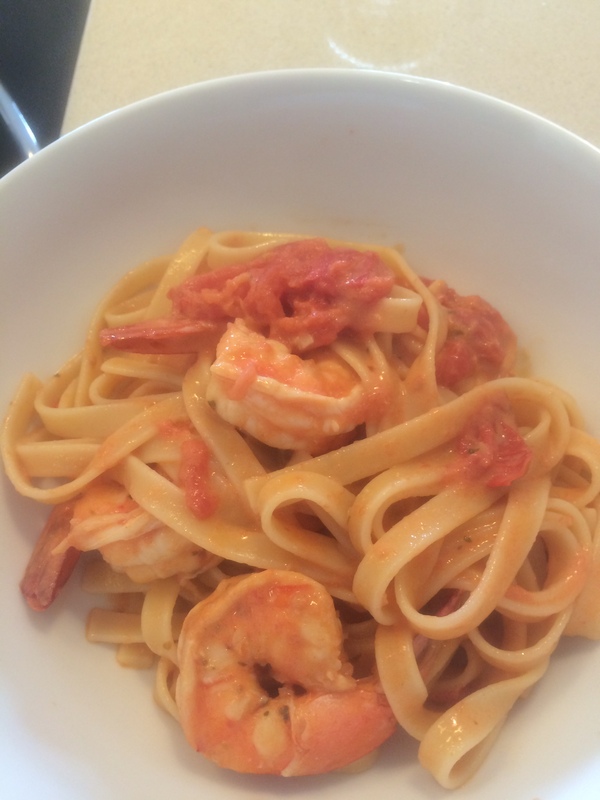 This recipe got sort of just thrown together last-minute because I had purchased the shrimp earlier in the day and was in the mood for pasta. There really is no time we are not in the mood for pasta and nothing quite satisfies like the real deal. I had everything else in the fridge but these are super easy ingredients and I highly recommend this recipe to all of you. It’s creamy and delicious without being too heavy. 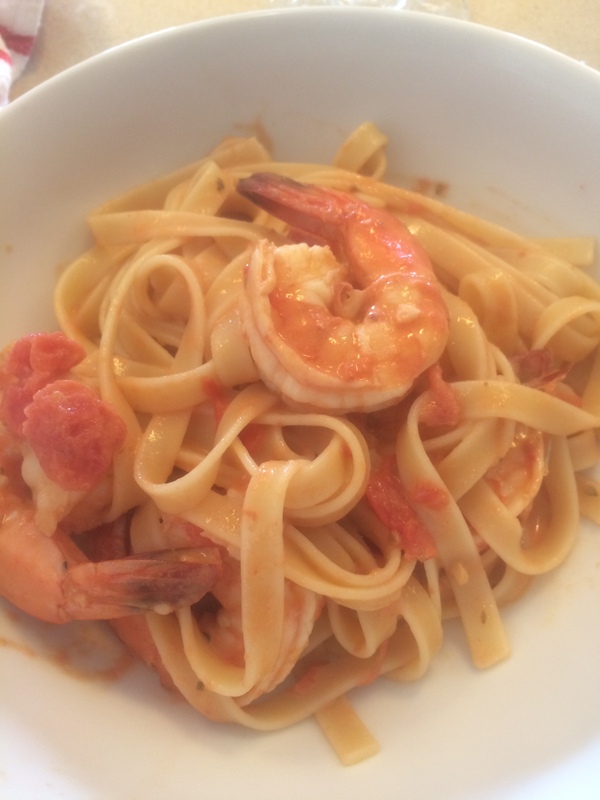 In the mood for pasta and shrimp? this one is sure to satisfy. 1 lb. 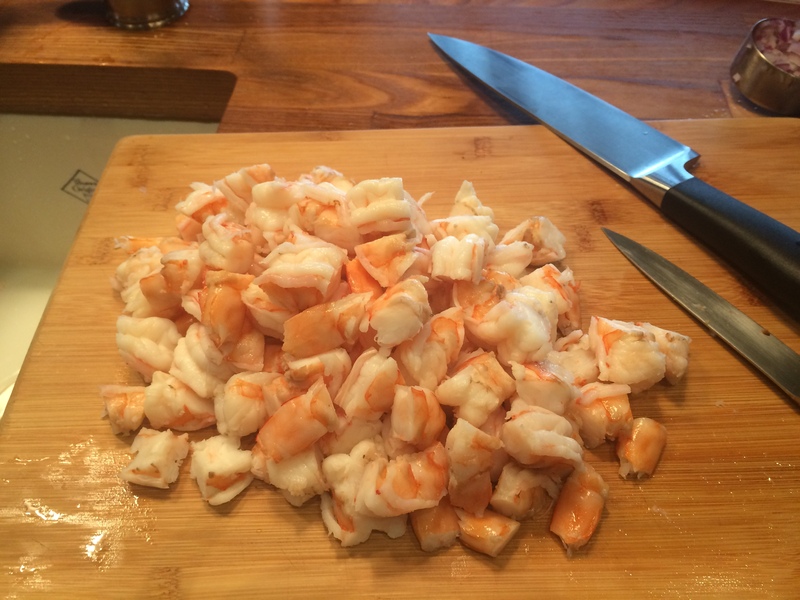 peeled and deveined shrimp, I used under 15 (15 to a pound) for the two of us. This could probably serve 3 to 4 as a side dish, and 2 – 3 comfortably as a main dish. Leave the tails on when you peel and de-vein. I only used 1/2 box of pasta but you can increase the pasta for more people. 1 15 oz. can of Tomatoes, I used whole but diced would be fine. Whole was what I had in the house and I just broke with the back of a wooden spoon while it was cooking. Either one would work just fine. *sprinkle of crushed red pepper–totally optional but if you like a bit of heat this works perfectly here. Use as much or as little as you like and can be added at table if you’re not sure everyone will like it. 1/2 lb. pasta–you can use capellini or fettucine or anything in between. I used fettucine because I was using what I had on hand in the pantry. Heat olive oil in a heavy skillet over medium-high heat ( at least a 12″ heavy skillet) Heat oil until it starts to shimmer but not smokes. 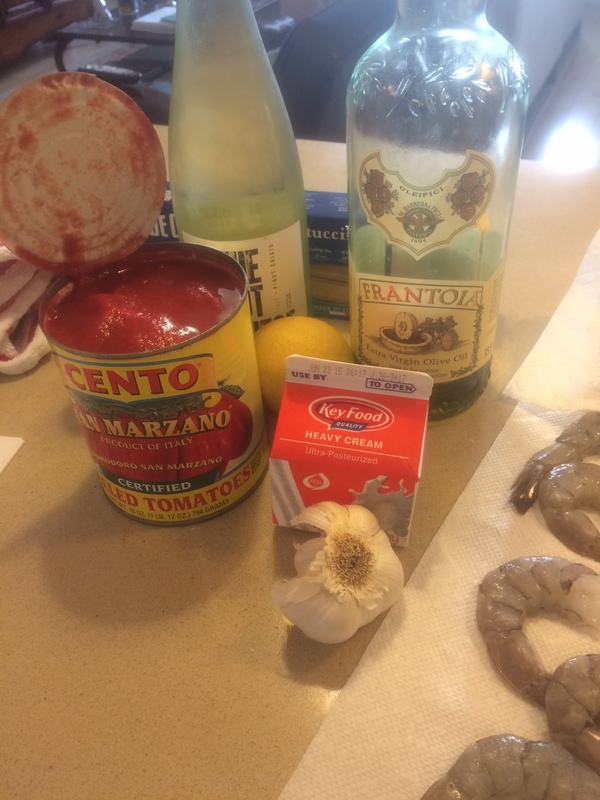 Cook shrimp along with garlic, oregano , app. 1/2 tsp. kosher salt and app. 1/4 tsp. freshly ground black pepper, turning the shrimp over after 2-3 minutes (as soon as shrimp curls). Stir in wine and tomatoes, scraping up any bits which may be at the bottom of the pan. Add heavy cream and briskly bring to a simmer until sauce has thickened slightly, about 2 minutes. Stir in lemon juice. 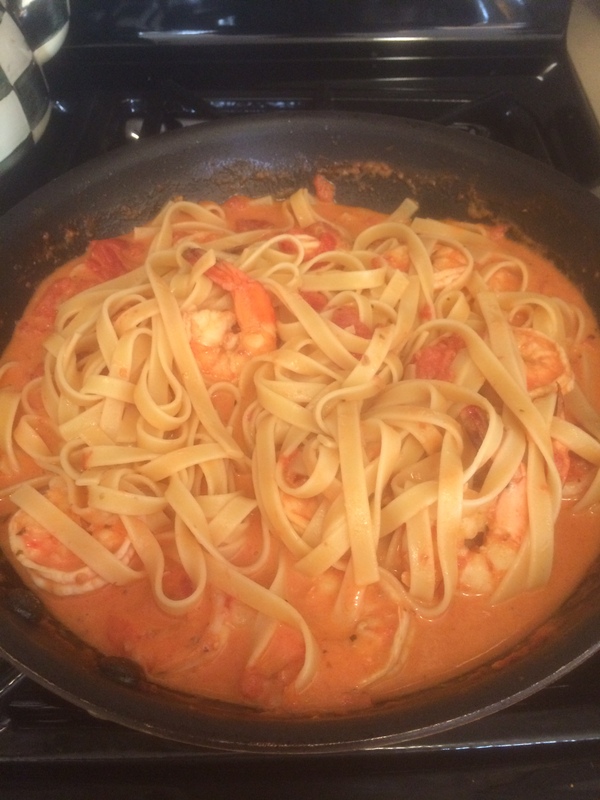 I let the sauce sit off the heat while I prepared my pasta, you don’t want rubbery overcooked shrimp. Meanwhile cook pasta according to box directions for al dente in a well-salted pot. Reserve 1 cup of pasta water . ( you may need water if sauce gets too thick) Drain pasta. I then turned on the heat and brought sauce to a low boil and added in the pasta. If sauce is too thick you can thin it out with a little pasta water. I only used a bit of the pasta water. It was divine. 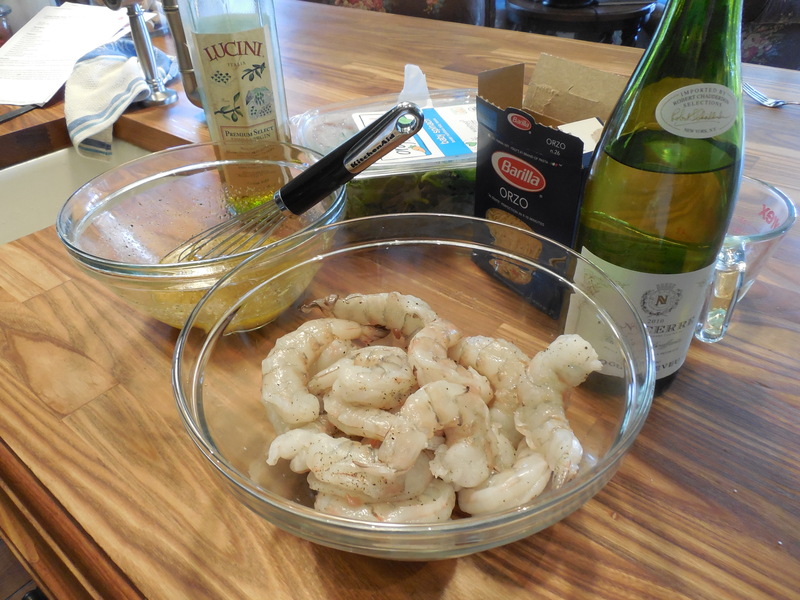 Most outstanding shrimp recipe from Ina Garten. All the tastes of the Mediterranean in one dish. 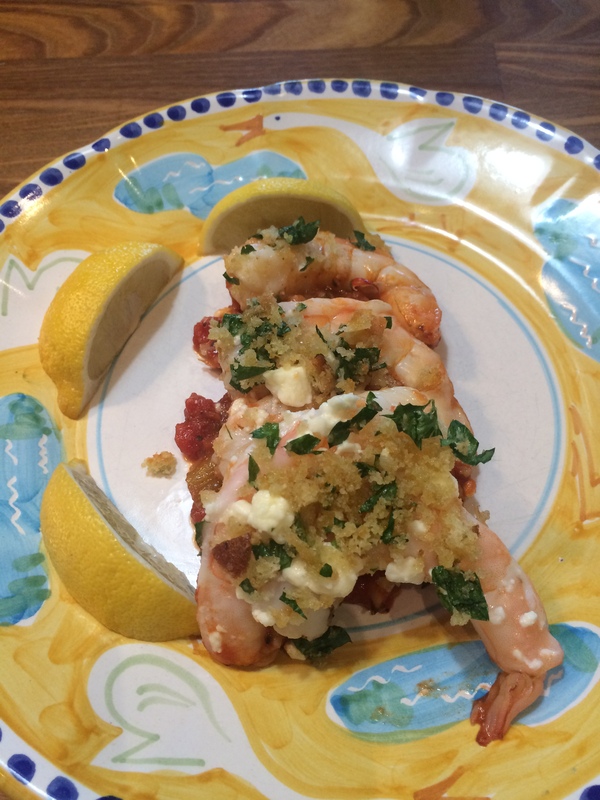 It’s roasted shrimp with feta, fennel, tomatoes, lemons, Pernod, wine and other good things. This was really so very delicious we ate it 2 nights in a row. It doesn’t need rice or pasta but if you’re having 6 people you can stretch it by adding the starch. I used 1 1/4 lbs. of shrimp and we had dinner for 2 nights. It was the first time making recipe so I wanted to use the right amount of ingredients. You can easily cut this in half for two people. This recipe as is will generously serve 4. 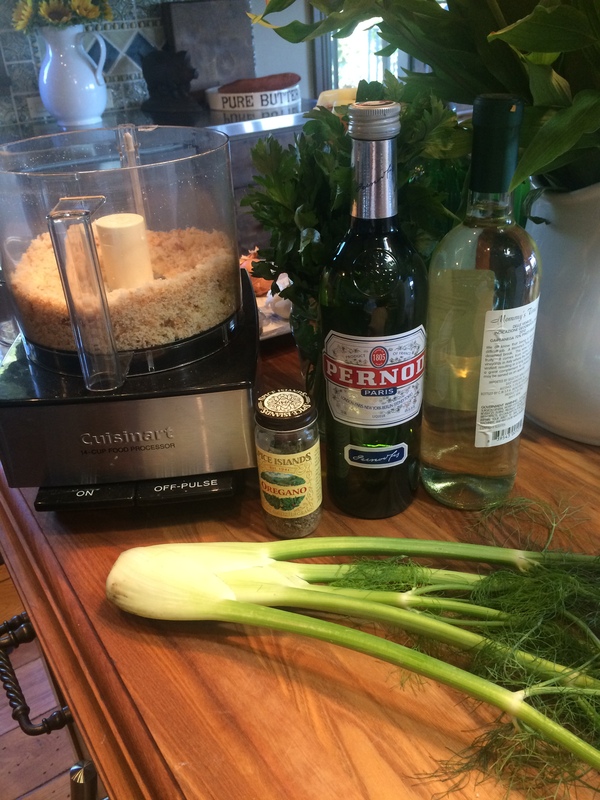 There are a lot of ingredients and I had to buy a bottle of Pernod but don’t let this discourage you. You’ll also need a 12″ heavy ovenproof skillet and there is a lot of prep but you’ll look like a pro when this dish comes out of the oven. It really wasn’t difficult and have your fish store prepare shrimp. (Peel and de-vein) if you’d like you can leave tails on but I didn’t and it was perfectly fine. 1 1/2 lbs ( app. 16 per pound) peeled and de-veined shrimp ( I prefer Mexican White and can usually obtain them) Talk to your local Fish Store. 1 cup fresh bread crumbs , yes I made them myself in the food processor–just throw 3 slices of white bread into food processor with crusts on and chop! it’s so much better than store-bought, just saying. Prepare shrimp and set aside, I like to place clean shrimp on paper towels to dry them before cooking. Spray 12″ skillet with cooking spray for easier clean-up. Heat 2 Tablespoons of olive oil over medium-low heat. Add the chopped fennel and sauté for about 10 minutes, until the fennel is softened. Add the garlic and cook for a quick minute. Add the wine and bring to a boil, scraping up any brown bits for about 2-3 minutes and the liquid is reduced by about half. Add the tomatoes with their liquid, tomato paste , oregano, Pernod, Salt and Pepper to the skillet. Simmer over medium-low heat , stirring occasionally, for about 15 minutes. 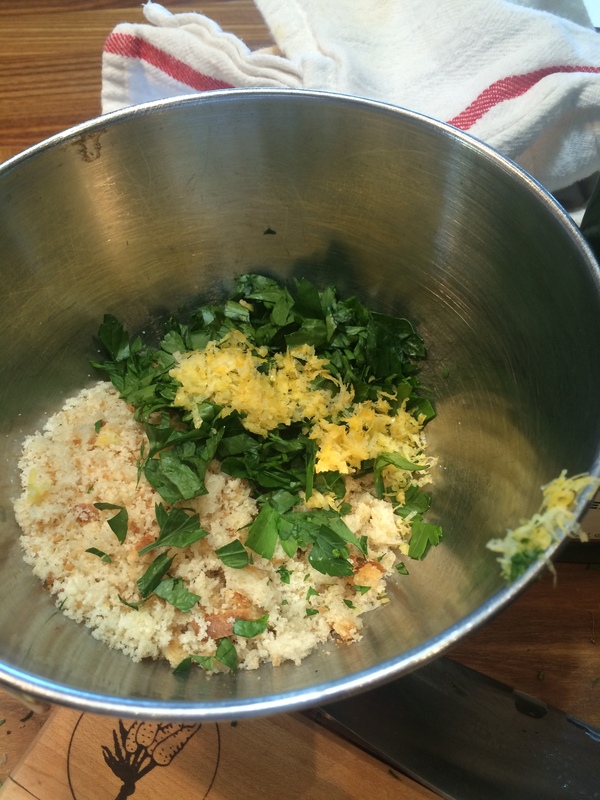 While the shrimp is cooking combine the bread crumbs, parsley, and lemon zest with the remaining 2 Tablespoons of Olive Oil and set aside. 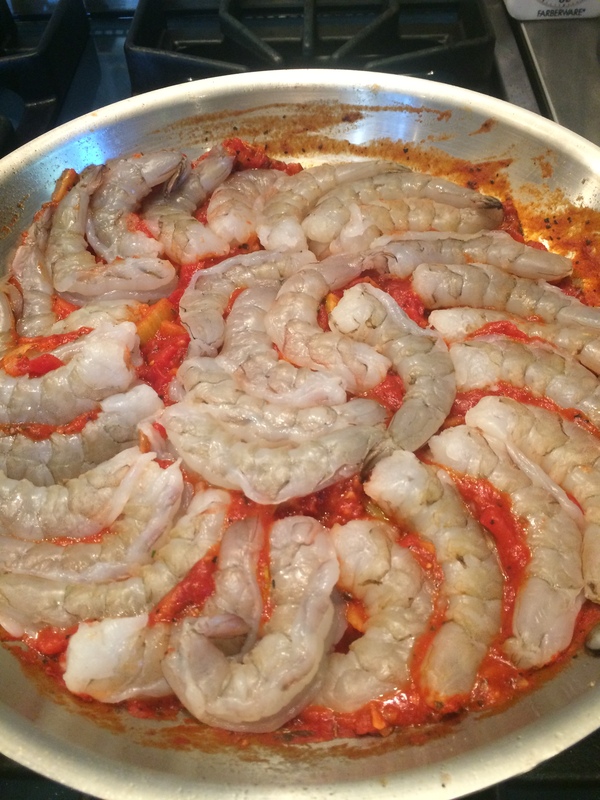 Turn off the heat and arrange the shrimp (see photo) in one layer over the tomato mixture in the skillet. 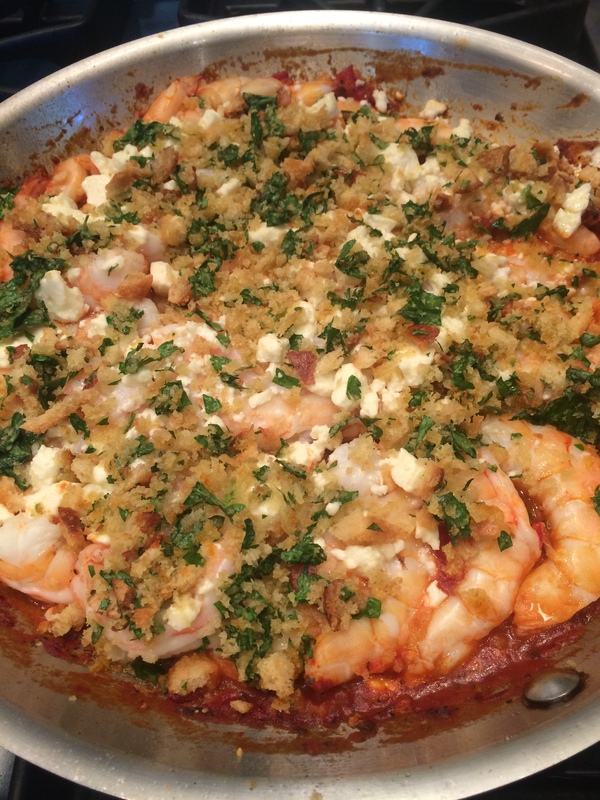 Scatter the feta evenly over the shrimp. Then sprinkle the bread crumb mixture over the shrimp. 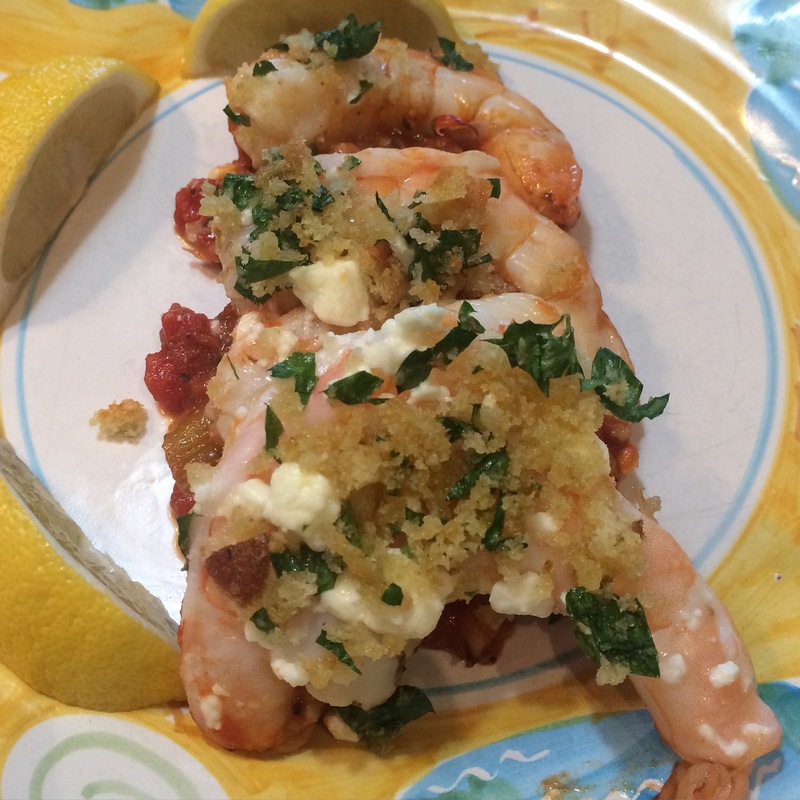 Remove from oven and squeeze the juice of 1 lemon (I used zested lemon) over the shrimp. Serve hot with the remaining lemon cut into wedges. All I can say is Wow!!!! I cooked about a lb.of beautiful shrimp and I wanted to use it in a delicious light salad incorporating some fresh corn and avocados. This salad has some of most favorite ingredients in it. I used fresh corn, fresh tomatoes, jalapeno, red onion, and shrimp! Limes are the secret ingredient here because they add all the flavor to this super light dressing. This has got to be one of the healthiest most delicious salads. Totally not fattening but filling because of the shrimp , corn and avocados. If you don’t like the ingredients you can Pasadena on this recipe because it’s definitely not for you. For those of you into it this is a must go to for summer entertaining. Light and Fresh , low in calories and so so easy to make. Perfect for weekend guests for lunch or as an appetizer with chips! 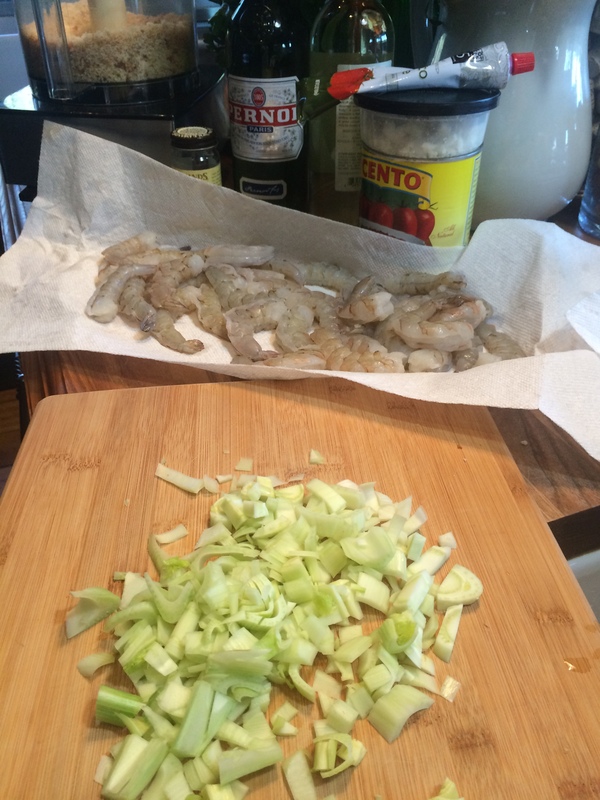 Cook shrimp- peel and de-vein or buy it cleaned and de-veined whichever works best for you. I like cooking my own shrimp but you can certainly use a “cooked shrimp” readily available in most markets. This photo was taken with a Spanish type rice. 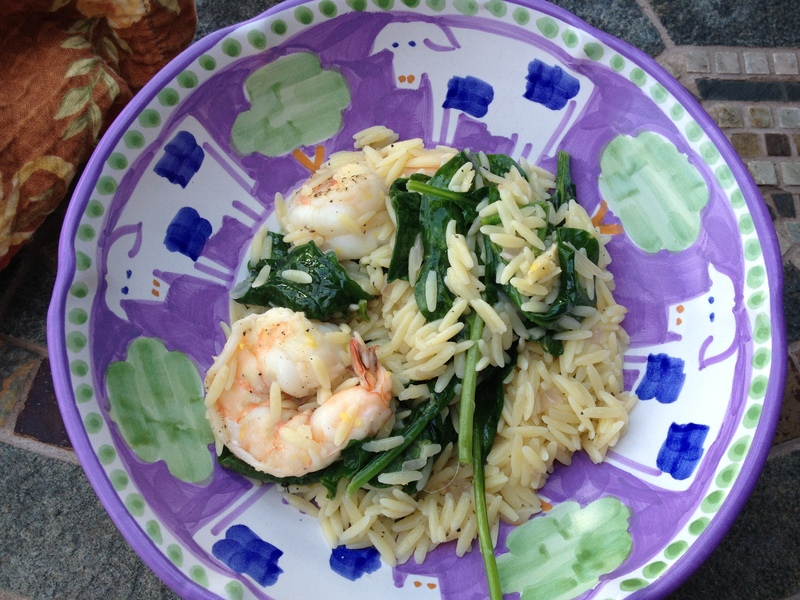 Any rice , pasta or all by itself — perfection on a plate! This is one of my all time favorite recipes and the easiest, quickest to prepare. Buy shrimp from a reputable fish store or Whole Foods type of market and have them clean and de-vein them. My husband Joel is an ex-seafood guy and he always cleans and de-veins the shrimp. It is a collaborative effort in our house. 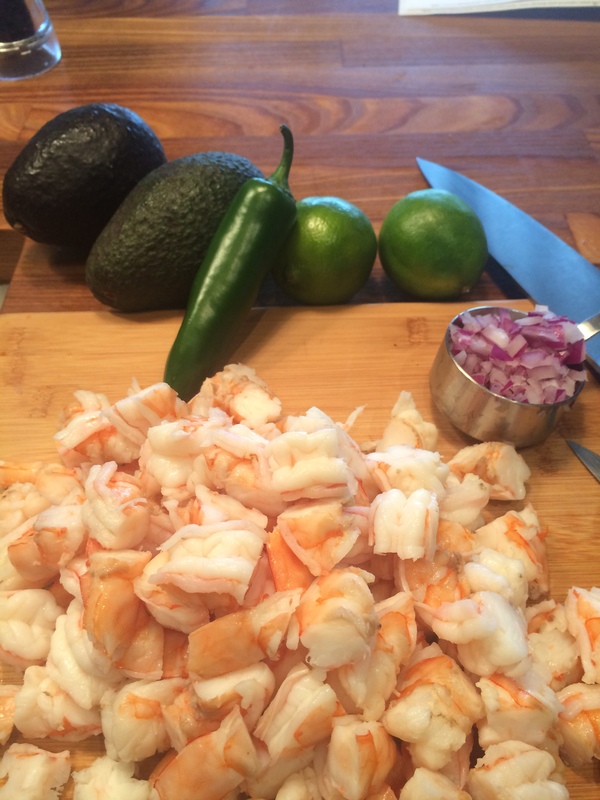 Once the shrimp and prep is done this recipe takes all of 15 minutes to cook. Ingredients are simple and you probably have most of the ingredients in your pantry. Directions are super simple and so easy to follow, you will look like a “super chef” and impress the pants off of everybody! 1 1/2 lbs. large or extra large shrimp .shelled– we are big fans of Mexican White Shrimp and I used under 10’s which means there are approximately 10 to a pound. 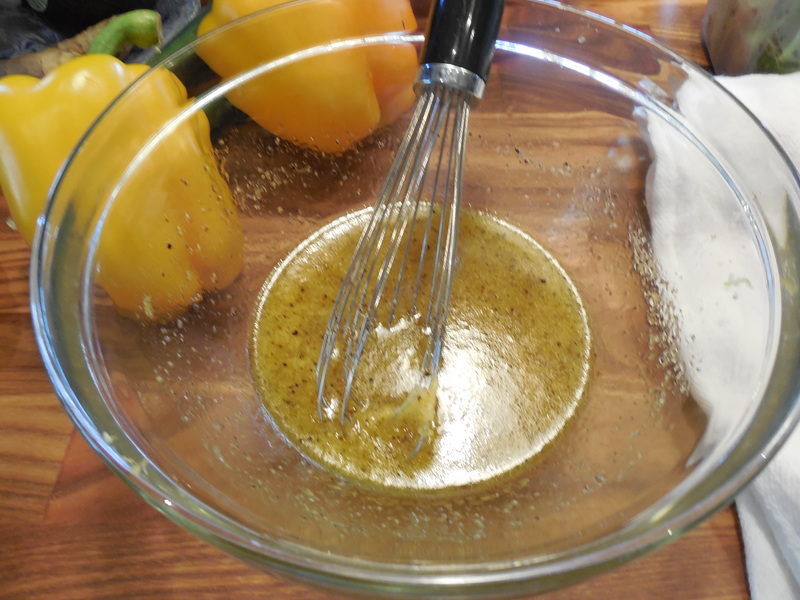 In a large skillet, melt butter along with olive oil. Add garlic and saute until fragrant , app. 2 mins. Add wine or broth, salt, red pepper flakes, and black pepper and bring to a simmer. Let wine reduce by half, app. 3 minutes. Add shrimp and saute until the shrimp just turn pink, 2-4 mins. on each side depending on their size. 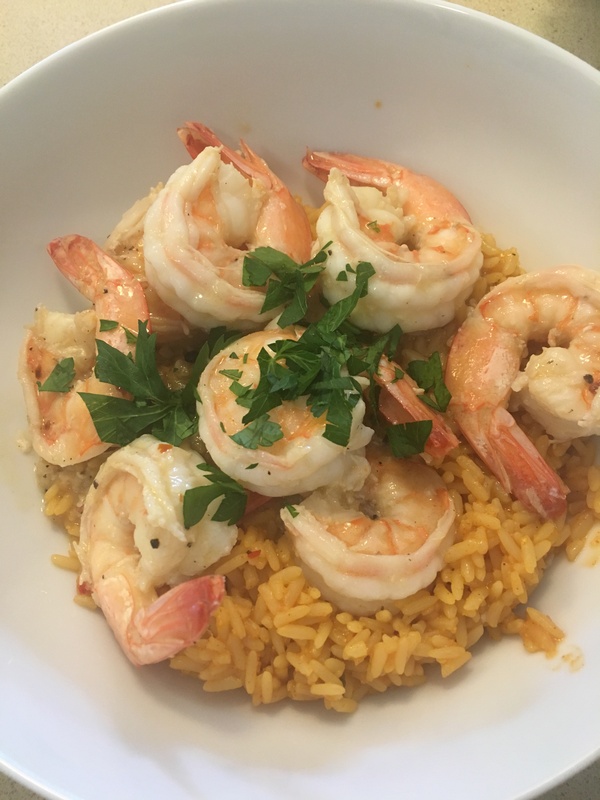 Squeeze the lemon over the shrimp, I stirred the shrimp in the sauce one final time and served over brown rice and using a large spoon poured any excess sauce over the shrimp (as much or as little as you’d like) I then sprinkled with a little fresh chopped parsley and Voila!!!! 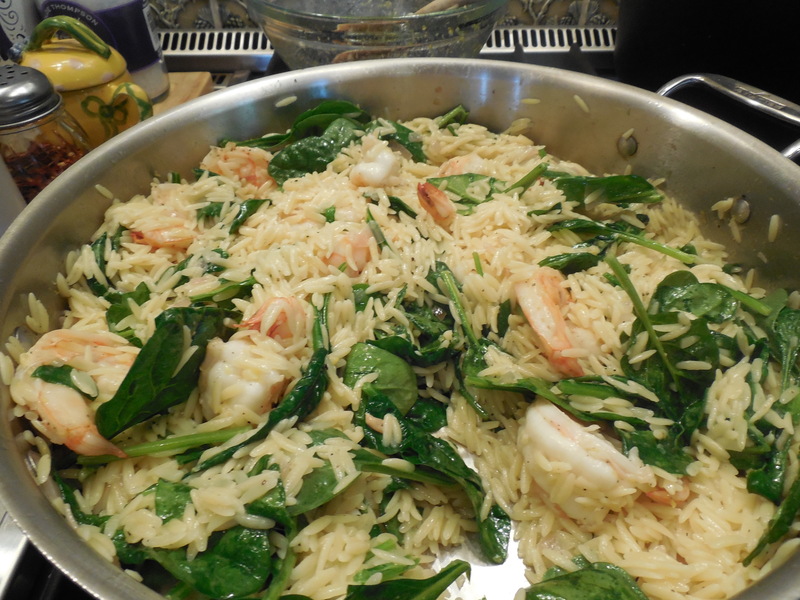 This shrimp would be delicious served over rice , pasta or all by itself. Add shrimp and saute until the shrimp just turn pink, 2-4 mins. on each side depending on their size. Squeeze the lemon over the shrimp, I stirred the shrimp in the sauce one final time and served over brown rice with a sprinkling of parsly. 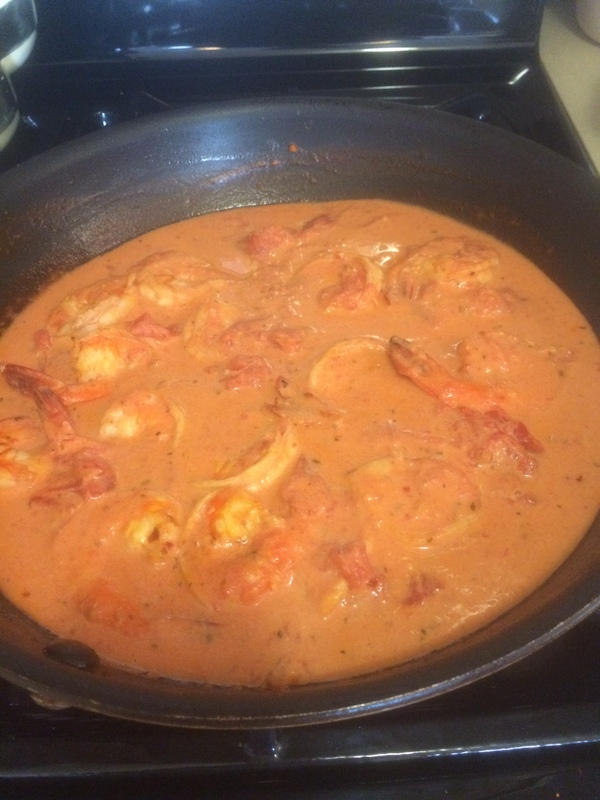 This shrimp would be delicious served over pasta as well.